If you hold two five card suits, or even two six card suits, which suit should you open with? The answer is that you should always open with the higher ranking suit (not the stronger hand). The rank of the suit takes precedent over suit quality. 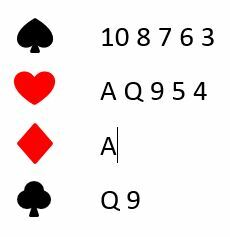 So, the example hand above should be opened with a spade bid not a heart bid. Suppose you had opened 1 H and partner replied with 1NT, 2C or 2D? You don’t have 16+ points, so you wouldn’t be able to bid your spades as this would mean bidding a new suit above the barrier. (The barrier here being hearts if you’d opened in hearts ). If you did bid the spades this would tell your partner that you do have 16+ points. Should You Draw All The Trumps? How Long Does It Take To Learn Bridge? Can Playing Bridge Help You Lose Weight? Is Playing Bridge A Criminal Activity? Bridge – An Olympic Sport?